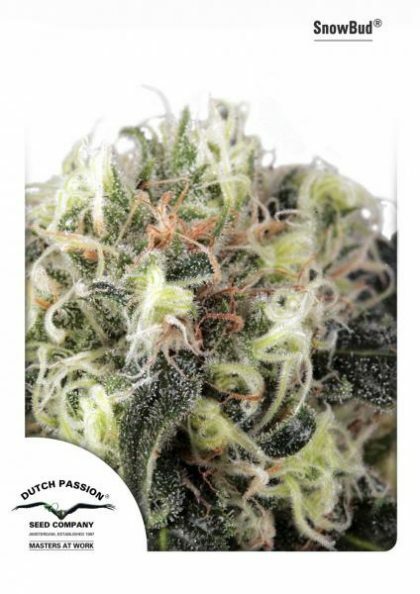 Dutch Passion’s Snow Bud feminised cannabis seeds are a hybrid of South African and Afghani genetics and have been developed to create a high altitude variety. This Sativa (60%) and Indica(40%) blend produces an above average yield of plants with white resinous buds that can be grown indoors or out. Snow Bud Feminised Cannabis seeds by Dutch Passion grow into tall, robust marijuana plants that have a cinnamon and skunk taste and aroma. This strain has a smooth smoke and a medium uplifting effect. SnowBud is Dutch Passion’s second ‘High Altitude’ variety. SnowBud is a hybrid of Afghani and South African genetics. As with Pamir Gold the selection work is done in the Swiss Alp’s. SnowBud (60% Sat./ 40% Ind.) has a spicy (cinnamon), skunky smell and taste, smokes very smooth and has a medium ‘up high’. Healthy plants may reach 1.8 till 2.2 meters outdoors. It is mould and mildew resistant. The yield is above average both indoors and out. The name SnowBud refers to the huge amount of white pistils in the female flowers (buds).